For your safety all our cars have ABS and driver and front passenger airbags. We believe having ABS is very important. Thai driving skills are not good so you will be braking hard and frequently when driving in Thailand. Knowing your car is equipped with ABS so it will not skid out of control under heavy braking is very assuring. Most budget cars for rent in Thailand do not have ABS and many only have one airbag. The new 2014 Thai Toyota Yaris is not the same as the Yaris sold in Europe and America. It is actually based on the top selling 2014 Toyota Vios 4 door saloon so it is considerably larger and the styling is more sporty and aggressive. The engine is a brand new 1.2 litre four cylinder petrol engine which is mated to an automatic CVT gearbox which gives excellent performance and fuel economy. The CVT gear box has two modes, eco and sport. Eco gives great fuel economy and Sport turns the car into a fun little racer that can outperform many bigger cars with larger engines. The new Thai Yaris competes with larger cars in the class above such as the Honda City and Toyota Vios, but it is cheaper to rent because of it’s lower purchase price and insurance. Our Yaris rental cars come with twin airbags, abs, aircon, central locking and a radio/cd player. If you want a budget car for driving around town, going to the beach, shopping etc, the Toyota Yaris is an excellent choice. The Nissan Almera is larger than most cars in the class above, and although it only has a 1.2 litre engine the CVT gear box has been tweaked to give the car amazing performance and outstanding fuel economy. This car has to be driven to be believed. The engine performs like a 1.5 litre and provides the car with enough power and acceleration for every day driving, there is loads of rear leg room, a huge boot (which will swallow up at least five golf bags) and the ride is super smooth and exceptionally quiet. The Almera will happily cruise all day long at 120-130KMH and return 17-20 km per litre ! Our Almeras are top spec with driver and passenger airbags, climate control, abs, alloy wheels, rear headrests, electric windows, electric folding mirrors, remote central locking, multi-function trip computer etc etc. They even have start-stop technology (which can be turned off) and the stereo controls on the steering wheel. If you need a lot of space and comfort on a budget the Almera is the perfect choice. 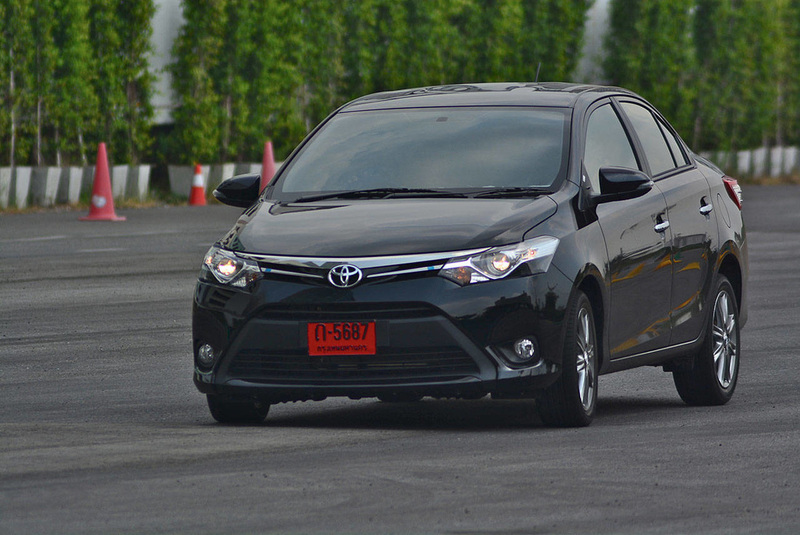 The Toyota Vios is the most popular “medium sized saloon car” in Thailand. It is a spacious 4 door saloon with a 1.5 litre 4 cylinder petrol engine mated to a 7 speed CVT automatic gearbox. The engine is a “Dr Jekyll and Mr Hide” VVT-i unit. Drive it sensibly and it is quiet, refined and returns excellent fuel economy BUT put your foot down and the high sweet revving VVT-i engine roars into life. Ours Vios are the latest generation with the new 1.5 dual VVT-i engine and 7 speed CVT automatic gearbox. They are well specified with twin airbags, ABS, EBD,VSC stability control, Aircon, AM FM radio/mp3 player via USB/AUX, central locking and electric windows. 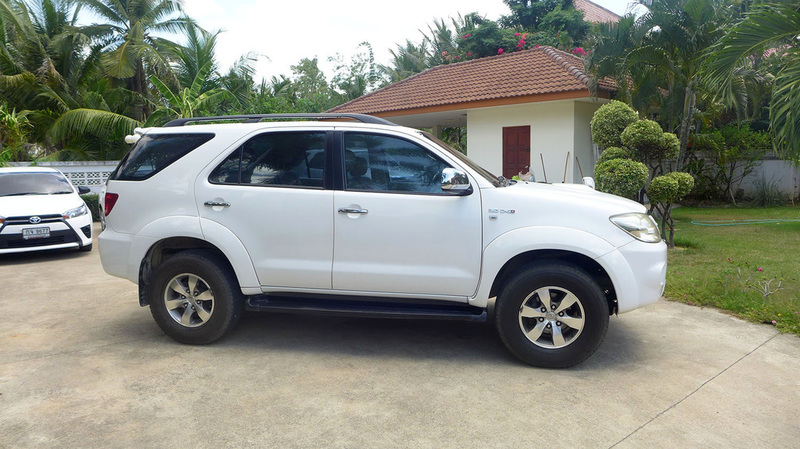 The Toyota Fortuner is a luxury sports-utility vehicle (SUV) which happens to be the most popular SUV in Thailand. It is based on the Toyota Vigo pick-up which is renowned all over the World for its reliability, go anywhere ability and high mileage longevity. The Toyota Fortuner comes with seven seats (the 2nd and 3rd row of seats can fold to give more cargo space), a quality interior and a fine balance between on and off-road capabilities. Our rental Fortuners have the 3.0 litre turbo-diesel engine mated to a five-speed automatic gearbox and permanent 4 wheel drive. They also come with driver and passenger airbags, ABS, dual aircon, a cd/mp3 player, leather or faux-leather seats and parking sensors. The large overall dimensions give the Fortuner a very spacious interior with plenty of leg room. 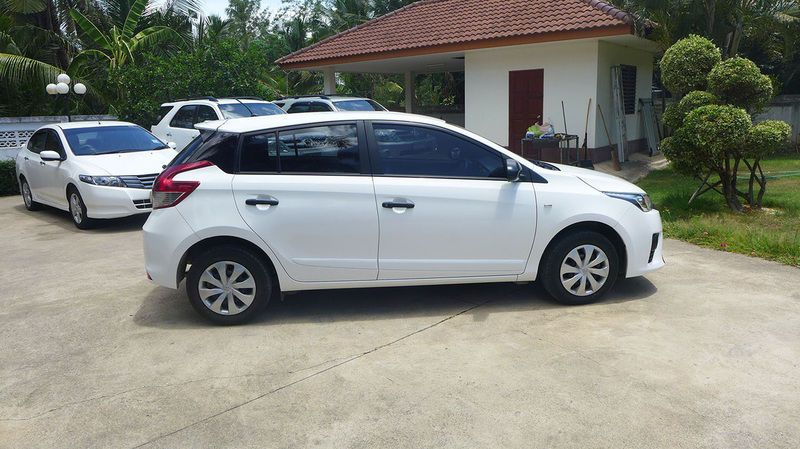 The car is big, strong, powerful and safe and it is DEFINITELY the best choice for Thailand’s roads which can be quite rough when you venture off the main highways. If you are big in stature, safety conscious, travelling with 4-6 passengers, or you plan to travel / explore out of town and off the major highways, then the Toyota Fortuner is the best car to have. If you plan to stay on the major roads and highways and drive around town the Toyota Yaris, Nissan March, Almera and Honda City are great cars BUT their low ground clearance is not suitable for driving on unsealed, dirt roads. We have a selection of Toyota Fortuners and will beat any written quote from any other rental company that offers full car hire insurance and breakdown cover.